Home Edu4Sure Education System Is Reservation In India Really Solving Its Noble Cause? Currently, India is suffering from many obstacles that is restraining its growth and development, the reservation system is one of them. 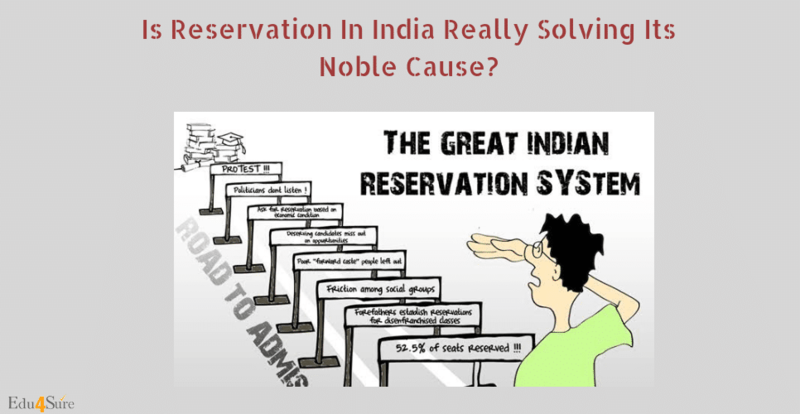 The reservation system has its roots in the Indian caste system. In India, the caste system was meant to divide people based on their birth and occupation. According to the Dharma-Shastra in Hinduism, the society was divided into four categories. The ‘Brahmins’ were on the top of the list, they were superior to the rest, they used to teach and preach, then there was the ‘Kshatriyas’ who were related to kingship and war, then the next is ‘Vaishyas’ who were associated with businesses and the lowest class was ‘Sudras’, the people belong to this class were considered to be impure and untouchable. They were oppressed by the upper classes in many ways. As a result, they fell behind from the other classes and were trampled by the upper classes and used as labors. The reservation system was meant to offer the proper chances and scopes to the lower-class people so that even they can grow and have a decent lifestyle. As these communities to deserving a place in the society. The system of reservation in India is about reserving access to seats in the various legislatures, to government jobs, and to enrolment in higher educational institutions. This was originated to compensate the disadvantage they had faced for many years. These lower castes and tribes are listed as Scheduled Castes and Scheduled Tribes (SCs and STs) and Other Backwards Classes (OBCs) by the Government of India. This reservation or quota system existed before independence, in the rule of the British Empire. Apparently, it may seem that they did this for the sake of unprivileged people, but actually, there was a cunning plan behind this; we all know, British people believed in ‘divide and rule’ policy. So, they introduced this reservation law, which succeeds to create a discrimination in the native people. This was a gain to the British. Though this law had some positive sides too, it helped some unprivileged people to have a place in the society. After the independence of India in 1947, there have been some major initiatives in favor of the STs, SCs and OBCs.The country’s affirmative action programme was launched in 1950 and is that the oldest such programme in the world. In 1954, the Ministry of Education suggested that 20% of places should be reserved for the SCs and STs in educational institutions with a provision to relax minimum qualifying marks for admission by 5% wherever required. Currently, as per the government policy, 15% of the government jobs and 15% of the students admitted to universities must be from scheduled castes and for the scheduled tribes there is a reservation of about 7.5%. Other than this, the state governments also follow their own reservation policies respectively based upon the population constitution of each state. So nearly 50% seats are reserved. And this is causing problems between different castes. The candidates from the general category are unable to get the chances and scopes which they deserve. Being a developing nation, India is facing the reservation system as a challenge. Currently, we are fighting against many discriminations, caste discrimination is one of them, it is hindering the equality. Though this system helped a lot to overcome the issues that the lower classes used to have but however in today’s time one of the major roadblocks to the right to equality is the reservation system. The Mandal Commission was established in 1979 by the central government to spot the socially or educationally backward people. It used social, economic, and academic indicators to see backwardness. But today these reservations are not being utilized on the mentioned factors. The benefits are being stolen away by the narrow-hearted people, who are only concerned about their own increment. In the current time, this reservation is creating some discrimination between several castes. By reserving one category against another creates a feeling of division which is now creating a clutter in the society. Every single person from the general category is against caste-based reservation but how many of us are against caste-based discrimination too? We live in the 21st century but some of us are still living in the dark corner of our heart when it comes to caste and creed. We need to understand that we have to fight against both issues, caste-based reservation, and caste-based discrimination. India is a place where people from different caste and creed live together, everyone belongs to different social and economic level. We need the reservation, no doubt on that, but that reservation should be for the people who are economically backward and who really need these benefits. But just as British used this reservation system to establish their power on us, similarly, now the Indian politicians are using this system for their own interests. Reservations are nothing but the means to prosper the vote banks of the politicians. They know they will be benefited by this system so they are not taking any initiatives to foreclose this system. The fighting against this caste-based reservation should be continued. India should have reservations based on the economical situations. Some seats should be reserved for the poor people who really need this. If someone is financially incapable to get proper scopes then our system should be able to fulfill his or her need by providing quality education and chances despite caste. This reservation system should be lucid and more fruitful. Everyone should get chances and scopes based on their merit. Politicians will never take any initiatives as it is favoring their interest. We have to bang on this point, again and again, to pressurize the politicians to change it otherwise we will only have debates and articles on this topic and nothing will take a turn.